It was summer, in rural northern Indiana, and my uncle, who was in high school, was broke. He and his friend went looking for odd jobs, and Don Eberly, the local apple orchardist and retired school bus driver (who I've written about previously here), said that he'd pay Brett and his friend to drive up to an orchard in Michigan, pick up a haul of peaches, and bring them back. Desperate for cash, they agreed, spending the last of their money on gas for the trip, north of Grand Rapids. On the way home, the back of their truck filled with peach crates, they were starving, but had no money left for food. So they hauled a crate into the cab, set it between them, and ate peaches all the way home, throwing pit after pit out of the open windows. When they got back, they got their money, but were completely sick on peaches, and to this day Brett is nauseated by the taste and smell of them. I'm glad I've never had such an experience. To me, there's nothing like a fresh peach in the summer time. It's almost unbelievable that something so sweet and juicy is even real. 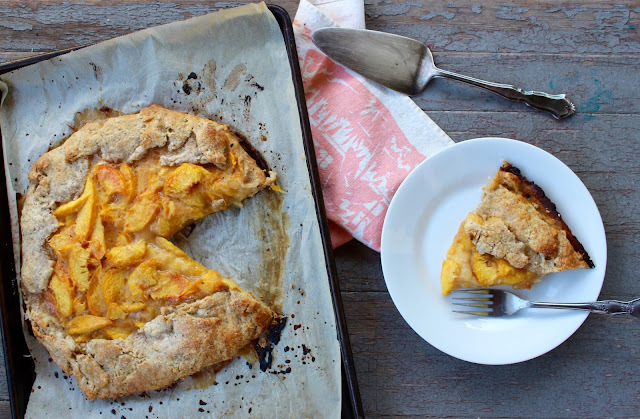 I actually think I favor fresh peaches over baked, but this galette recipe allows the slices to still maintain their integrity, avoiding the goopy, gelatinous mess that you find in some peach pies when the steam captured by a double crust breaks down the fruit. 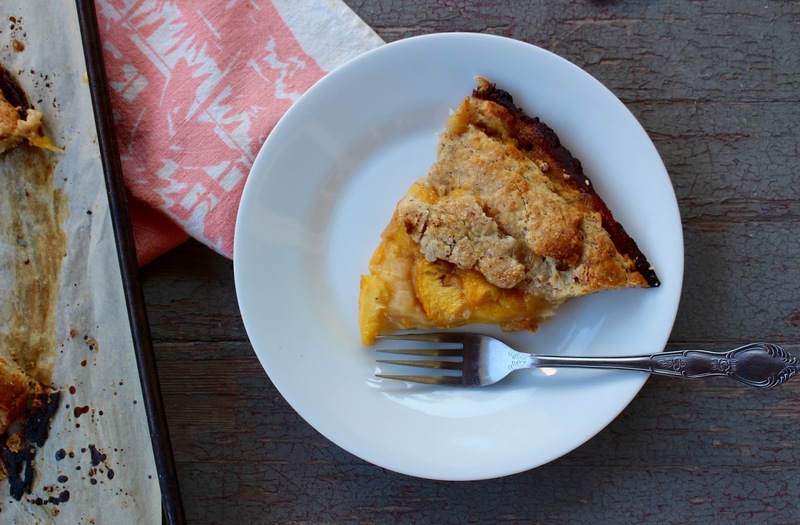 You can use the standard Nothing in the House pie crust recipe for this-- it'll be flakier-- but this is more of a biscuit crust, with the added texture of the almond meal pairing well with the sweet stone fruit. 1. For the crust In a large bowl, whisk together flour, almond meal, sugar, and salt. Cut in butter cubes using a pastry cutter or knife and fork until texture resembles cornmeal and peas. Stir in the buttermilk with a wooden spoon. Mix until dough comes together, but is not overly mixed (it should be a little shaggy). Form into a ball and flatten into a disc. Wrap the disc tightly with plastic wrap, and let chill in the refrigerator for at least an hour. 2. In a large bowl, stir together all ingredients until homogenous. Preheat oven to 375 degrees F.
3. Roll out crust in a large circle or oval on a piece of parchment and transfer crust with parchment to a large baking sheet. Ladle peach filling onto rolled crust, leaving a 1-inch border. Fold up the pastry over the edges of the filling, leaving most of the peaches uncovered. 4. 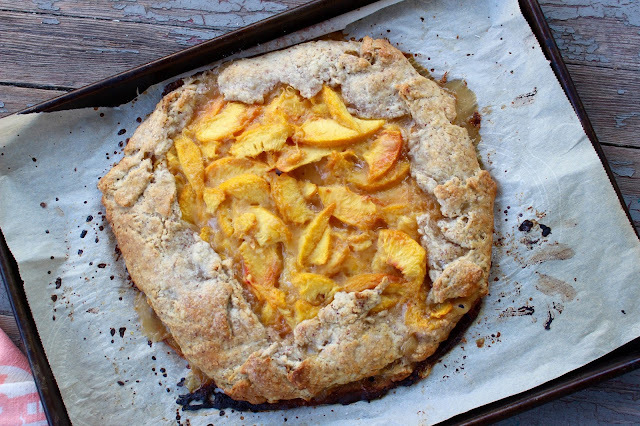 Place galette in freezer for 20-30 minutes while the oven preheats. Once chilled, remove galette from fridge and brush the pastry with the egg wash and sprinkle lightly with the remaining 1 Tablespoon of sugar. Bake tart in the middle rack of the oven for 30-40 minutes, until the fruit is bubbling and pastry is golden brown. Let the tart cool completely. Serve just warm or at room temperature with vanilla ice cream.